Hard water can cause many issues throughout your home. It causes white build-up on fixtures, countertops and in your appliances. The build-up will cause efficiency issues and will shorten the life of appliances, especially instant hot water heaters. Hard water can be found in well water, as well as some municipal water supplies. Hard water can cause dry, itchy skin and leave your hair feeling brittle. 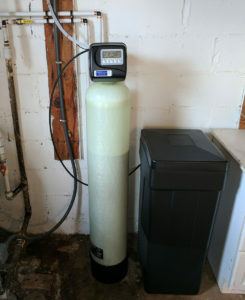 A water softener is designed to remove hard water. Our water softeners will leave you with silky, smooth water without all the build-up for many years to come!